Any dogs can take part in the championship, regardless of their age and breed. Dogs with vaccination and the corresponding marks about it in the pet passport are admitted to participation. Dogs are divided into categories according to their age and height. Dogs younger than 12 months are puppies (3 months -12 months), older than 12 months are adults (12 months + 1 day). • Category Maxi category – from 45.1 cm shoulder height. Any other categories can be claimed by the organizer. They are formed starting with 5 dogs in the category. Aim: a dog has to catch the moving PULLER ring a maximum number of times and return it to the owner. A competing pair, a dog and a handler / owner, begin their performance in the central zone – the start zone. Timing starts after an owner double-hits PULLER (double rings clap). 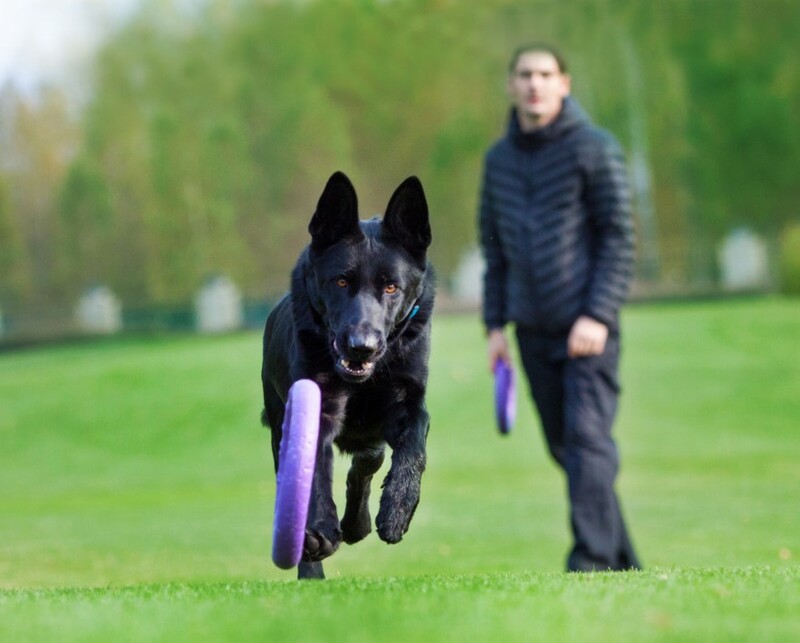 The performance consists of successive throws of the PULLER rings in different directions, so that a dog catches the rolling ring in the catching zone and brings it to the start zone. 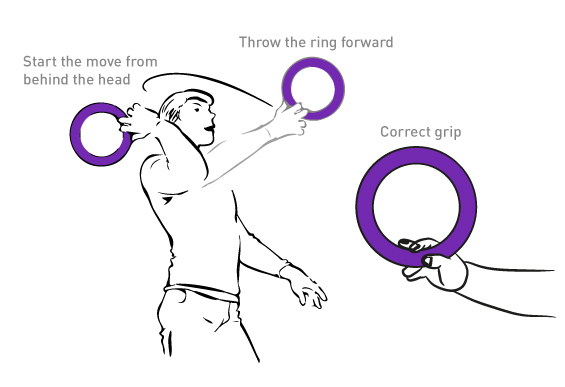 A handler / owner throws the PULLER rings one at a time, each time in other direction. 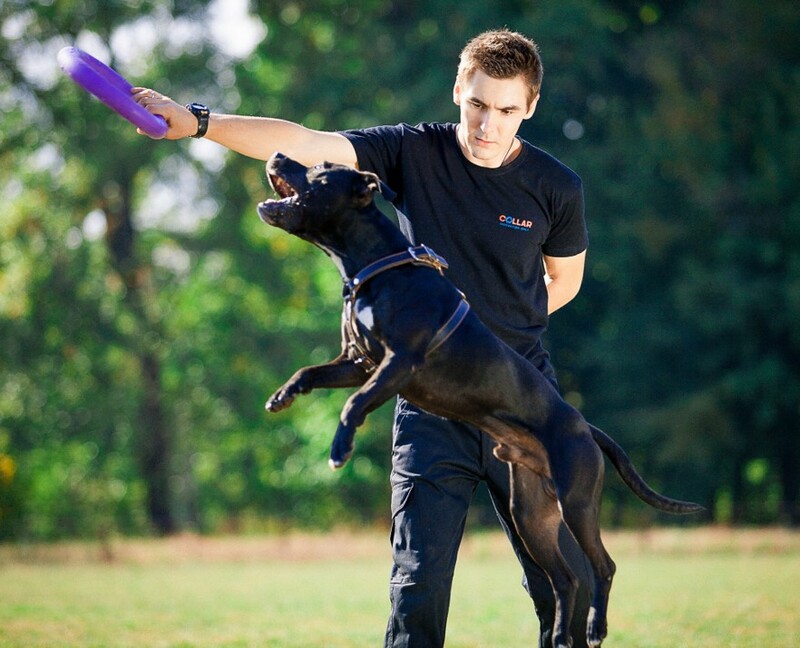 In the start zone a dog can leave PULLER on the ground or give it directly to a handler / owner. 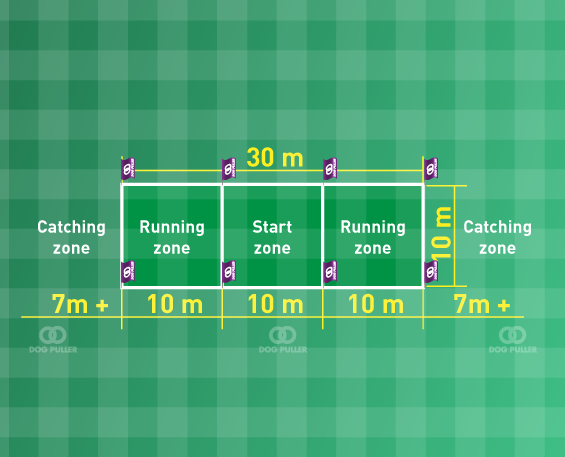 The size of the playing field is at least 50 m by 10 m. There should be three equal zones (3 squares) 10 x 10 m in the center. 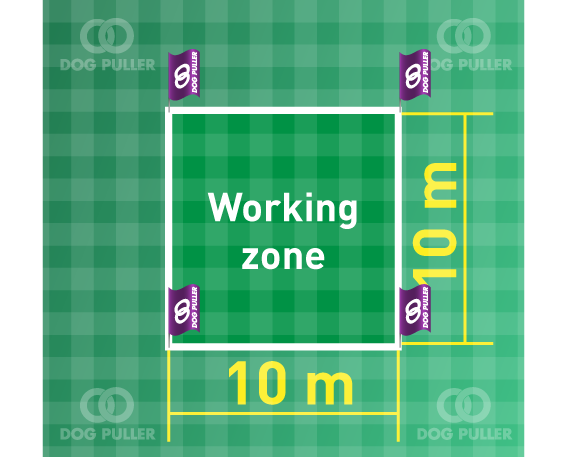 A dog catches a moving PULLER ring out of the 10-meter run-up zone mark and returns it to the start zone is 1 point. A dog takes a motionless PULLER ring is 0 point (not applied to the category Puppies). A PULLER ring is caught in the 10-meter run-up zone is 0 point. A dog drops the PULLER ring when returning to the start zone is 0 point (not applied to the category Puppies). If an athlete steps over the starting line, the throw is not counted. Aim: a dog has to jump and grab the PULLER ring a maximum number of times. During the performance, two PULLER rings are used. Timing starts after the owner double-hits PULLER (double rings clap). The performance consists of the successive grab of one of the PULLER rings by a dog lifting two or all four paws off the ground. 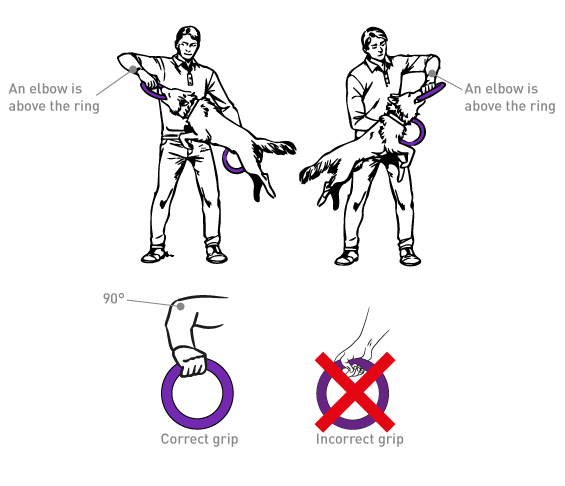 During the grab, the ring has to be in a handler / owner’s hand. Depending on the technique of a handler / owner’s work, after a dog grabs a ring with the jaws, a handler or a dog may release the ring. playground 10×10 m (a square). A jump with a grab lifting two paws off the ground is 1 point. A jump with a grab lifting four paws off the ground are 2 points. A jump without grabbing the ring is 0 point. A grab without a jump (without lifting at least two paws off the ground) is 0 point. PULLER has to be in a handler / owner’s hand and can be given to a dog only after being grabbed with teeth. The shape of the PULLER ring protects a handler’s hand from accidental bites, but the PULLER must be held correctly. A hand is pointing down and an elbow up. This position of a hand is correct and safe for a handler / owner of a dog, when performing a jumping exercise. A handler / owner’s hand is always pointed at a dog. Throw a PULLER ring from the top, starting behind an ear. It is desirable to hold the ring with three fingers. Direct a dog to jump for the PULLER ring horizontally, not vertically. Landing after vertical jumps can negatively affect your dog’s joints.